This is one of my favorite Graystone pictures EV-VER. Let’s see who can write the best caption for this photo. The winner will receive a free copy of the book, Exponential. 2nd place gets a Sports Camp T-shirt. 3rd place receives the free gift that we are giving dads this Sunday at Graystone. Humor and creativity will be rewarded. You can enter as many times as you would like. Let’s have fun with this! There you go, Katie. You’ve got the hang of it. Now go home and watch Teen Wolf and you’ll be a pro like me. Chris, I have no idea what you are talking about, but this is not the first time that you and I have been on different wavelengths. What is Heath going to do next? Jonathan is raising his hands in worship, or he’s praying that this won’t be the end of his ministry. Mandy, I love how you pointed out my 7 foot wingspan. red rover, red rover, send ‘motorcycle dude’ right over! 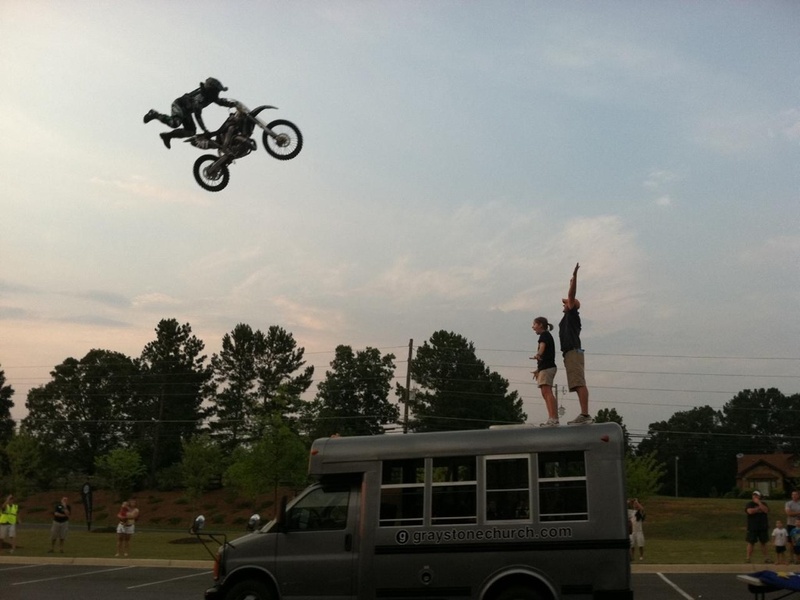 As kids watch a Motorcrosser jump from a plane on his dirt bike, motorcrosser-skydiver lets Childrens Pastor Katie Landress and Pastor Jonathan Howes know through radio contact that he has accidentally jumped without his chute. An attempt to lead the motorcrosser to Christ before he hits the ground was successful with time to spare. So, Jonathan trys to get him to do a Superman for his last trick. Thanks to quick thinking by Graystone’s finest the Motorcrosser was Saved and will spend eternity with Jesus Christ. Graystone’s Bus was not damaged in this story…….. And next years theme will be bounce, not jump. Chad, I bet you played with Stretch Armstrong as a kid. OH NO, the birds made it look easy…………..
You can pick your prizes up at Guest Services. Thanks everyone for playing.